Textiles as a medium, is broad and complex. It has a history that is domestic, as well as aesthetic, practical, as well as decorative, singularly one dimensional, as well as infinitely multi-dimensional. It is this dichotomy between textile as functional fabric, and textile as expressive artform, that helps to give broad expression to the textile world, but it can also, at the same time, make it difficult to understand what textile as art really is, and where it fits into the great complexity that is the creative arts. Where textiles as art finds its eventual place, is still an ongoing one. That more and more artists and designers are turning towards the broadening of the scope of textile art as an expression of themselves and the world they both see and interact with, has changed the surface of textiles as art, literally. The textile artist and designer Jennifer Gaye has a deep relationship with the discipline, in both her incarnations as artist and designer. It would be fair to say that Jennifer's work in both the art and design worlds helps to influence all aspects of her work. The line between art and design is often a thin and perforated one, much more so than is often imagined, it helps to make each aspect of her attention, whether art or design, the stronger for the understanding from the different aspect. The inspiration for her artwork often comes from the natural world, often from the wide scapes of ocean and sky. She is keen to represent the many tones and layers that help to make up these two scapes, ones that dominate not only our vistas, but the planet as a whole. Interestingly, Jennifer sees both scapes being intimately involved in our created urban landscapes, folding into the urbanity, blending and toning down the aggressiveness, the dysfunction that is so often found there. It is the calmness and innocence of ocean and sky, of their layers, levels, breezes and currents, that so often help to temper our artificial landscapes, but more importantly, help temper ourselves within those landscapes. Jennifer creates the most beautiful of organic surfaces, each piece seeming to show the effortless drift of elements of sky and ocean. 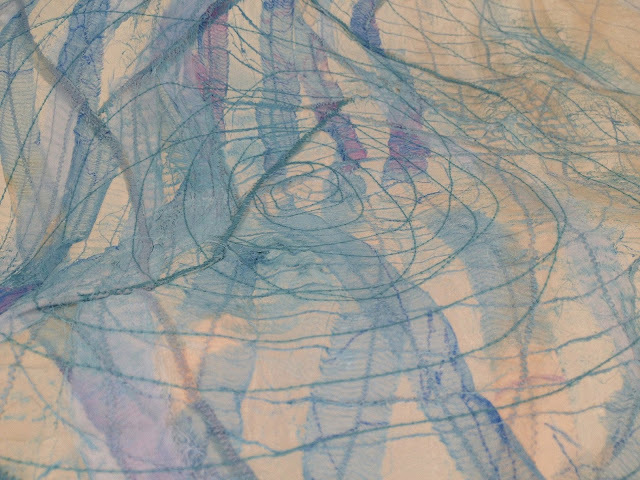 Currents of both realms are represented as careful layers of work, through layers of fabric and stitch. Almost ethereal in tone and feeling, her work shows no sharp edges and angles, no pressing urgency of direction, just the soft and gentle flowing of movement, seeming to both guide and glide along predetermined pathways, but pathways with only the gentlest hint of predetermination. 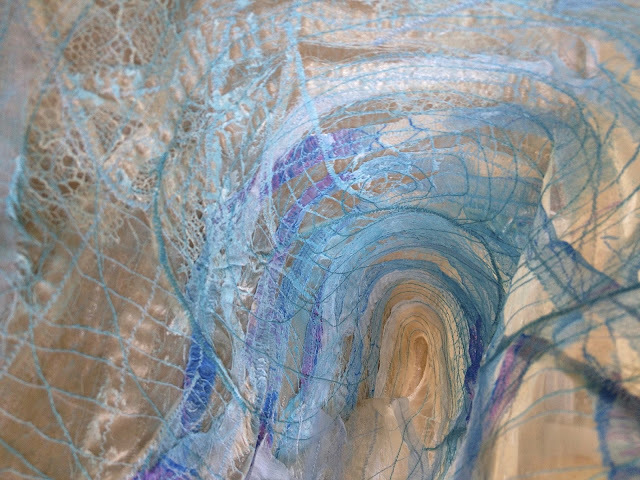 These beautiful surfaces show us that textile art is above all, one of feeling, of empathy, and of understanding. It is no coincidence that so many textile artists look to the natural world for inspiration. Nature has an affinity with the textile medium, as textiles have an affinity with nature. 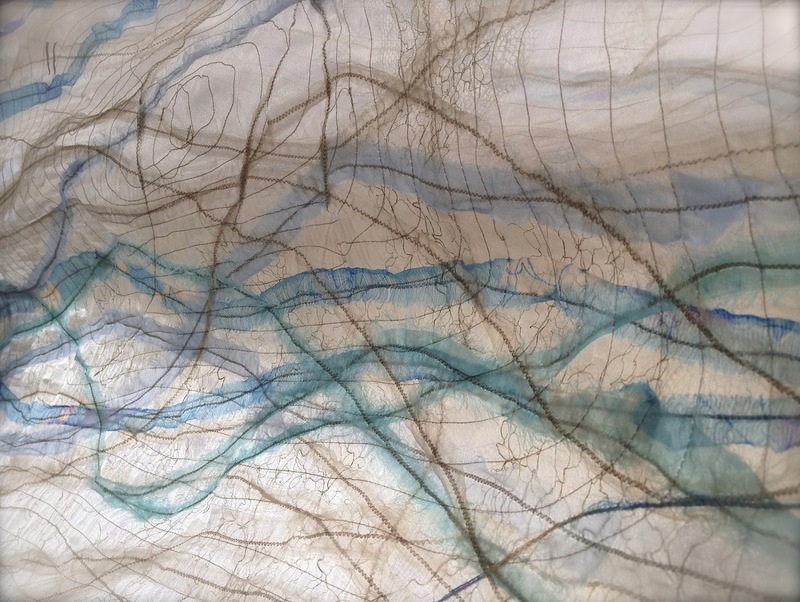 The two are so wrapt up with each other that it seems perfectly normal and expected when a textile artist projects an aspect of the natural world through their work. The textile art form has a sophistication of medium that is exemplified by the sensitivity of the artists that use the medium. Both are partners in their shared empathy with nature, and it is credit to Jennifer as a textile artist, that she exemplifies such a high standard of that shared empathy. The work of Jennifer Gaye can be found at her comprehensive website: jennifergaye.com, as well as at facebook, and instagram. Please be aware that the illustrations for this article were supplied by Jennifer herself. Please do not share any of these images without permission from the artist. Thanks! Thank you for your descriptive piece. What a wonderful article and artist. Thannk you. Thanks ever so much for your kind words regarding the article, particularly to Jennifer whose work it is, but also to Ute for her interest and kind support. It was a great article to write, and Jennifer's work was so beautifully photographed, a real pleasure. My pleasure Amanda, glad that you enjoyed her work.